Register for Teen & Young Adult Programs now on-line by visiting the link below. A link has also been made avaliable on the home page of our blog. Click on “Register on-line”. Check out this link to Logan Magazine. Stories to inspire, read how others have overcome obstacles in their lives and found their own personal success. This is an AMAZING magazine for ALL teens! So how do girls honestly address their self-esteem? With a craft of course! 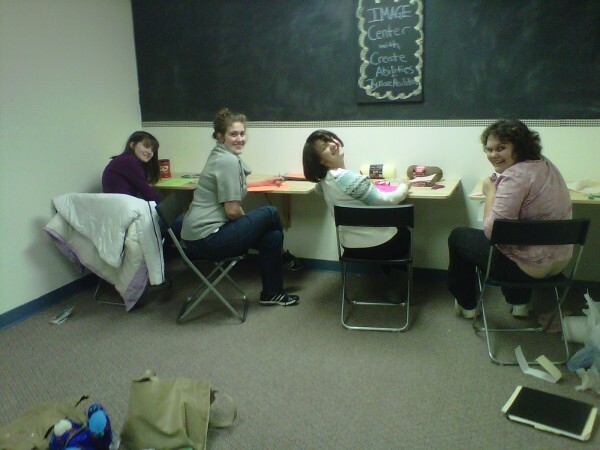 Here is a shot from last Thursday’s Girls Night Out Program. Here the girls are crafting self-portraits using yarn, jewels, materials and markers in order to identify characteristics about themselves that make them feel confident and boost their self-esteem! This week the girls will be joined by Zoey from the B’more Abilities Special Arts Center as they learn active techniques, such as Yoga, to relax and calm at home. Check back for more information on the programs that will be offered at of our collaborative studios in both Harford and Baltimore Counties with partner B’more Abilities. Looking for some fun? Join our collaborative partner B’more Abilties every Friday night for themed teen nights at the new Baltimore County studio! The “Girls Night Out” group will be having a Pajama Party at our Bel Air studio this Thursday from 6-8pm. We will be constructing self-portraits to promote a strong sense of self-awareness and watching an inspirational “chick-flick”. Not to late to register. For more information on the Girls Night Out program in Harford County or for more information on our other teen and young adult programs in Harford and Baltimore Counties email Jessica at jleone@imagemd.org. See you at Girls Night Out ladies!